Fees Rising in Arlington County? It’s Worse, Much Worse! A letter to the editor writer in this week’s Arlington Sun Gazette says the Arlington County Board "patted each other on the back for not raising the real estate tax rate," but continued "reaching into our pockets . . . by increasing fees for essential services." Specifically, he pointed out that the combined water and sewer billing rate has increased 71% over the last six years, in addition to an increase in the cost of parking meters. Well, it’s worse. Since overall real estate assessments increased by 6.3% from CY 2010 to CY 2011, which included both commercial (12%) and residential (1.4%), the effective real estate tax increase would have been 5.6% -- even if the real estate tax rate remained unchanged. But it’s even worse still. Reference Table E, page 171 of Arlington County’s Comprehensive Annual Financial Report for FY 2010. In 2001, “general property” taxes represented 79.5% of total general government tax revenues ($308.5 million divided by $$387.9 million). By FY 2010, the percentage of total tax revenues coming from “General Property” taxes increases to 83.9%. That means the County Board is placing a greater reliance on real estate taxes. Something to talk about during your next conversation with a member of the Arlington County Board? HT for picture to Army Live, the US Army's official blog. “Congress and President Lyndon Johnson declared Waterloo, N.Y., the “birthplace” of Memorial Day. There, a ceremony on May 5, 1866, honored local veterans who had fought in the Civil War. Businesses closed and residents flew flags at half-staff. Supporters of Waterloo’s claim say earlier observances in other places were either informal, not community-wide or one-time events. “By the end of the 19th century, Memorial Day ceremonies were being held on May 30 throughout the nation. State legislatures passed proclamations designating the day, and the Army and Navy adopted regulations for proper observance at their facilities. The VA adds that some Confederate states have their own days for honoring Confederate fallen heroes. "The 30th day of May, 1868, is designated for the purpose of strewing with flowers or otherwise decorating the graves of comrades who died in defense of their country during the late rebellion, and whose bodies now lie in almost every city, village and hamlet church-yard in the land. In this observance no form of ceremony is prescribed, but posts and comrades will in their own way arrange such fitting services and testimonials of respect as circumstances may permit. “We are organized, comrades, as our regulations tell us, for the purpose among other things, “of preserving and strengthening those kind and fraternal feelings which have bound together the soldiers, sailors, and marines who united to suppress the late rebellion.” What can aid more to assure this result than cherishing tenderly the memory of our heroic dead, who made their breasts a barricade between our country and its foes? Their soldier lives were the reveille of freedom to a race in chains, and their deaths the tattoo of rebellious tyranny in arms. We should guard their graves with sacred vigilance. Taste of Music has selected its Top 10 Memorial Day Songs. It includes Trace Adkins’ “Arlington” and Tim McGraw’s “If You’re Reading This," which you may want to read while reading this Growls post. A photo gallery of Arlington National Cemetery is here. Finally, the next time you’re in the District, take a few minutes to drive through Logan Circle, named after General Logan. Another part of General Logan’s legacy, according to Wikipedia is a memorial statue in Chicago’s Grant Park, and at least three U.S. counties are named after him. The Urban Dictionary describes ‘jumping the shark’ as “a “moment when somethin (sic) that was once great has reached a point where it will now decline in quality and popularity.” Two stories posted on Drudge Report this weekend -- one from Charlotte, North Carolina and the other from San Diego, California -- reminded me of the phrase. “Superior Court Judge Linda Quinn said La Jolla’s annual Fourth of July fireworks show requires evaluation under the California Environmental Quality Act, or CEQA. "Marco Gonzalez, a lawyer for the environmental rights foundation, exulted over Friday’s win, which comes after months of criticism against him for challenging an American tradition. “The fine will be dropped if the church replaces each of the improperly pruned trees, said Tom Johnson, senior urban forester for city of Charlotte Land Development Division. “Charlotte has had a tree ordinance since 1978, and when trees are incorrectly pruned or topped, people can be subject to fines, Johnson said. “Trees planted as a result of the ordinance are subject to the fines if they are excessively trimmed or pruned. These include trees on commercial property or street trees. They do not include a private residence. "The purpose of the tree ordinance is to protect trees," Johnson said. "Charlotte has always been known as the city of trees. When we take down trees, we need to replace these trees." “Individuals who would like to trim their trees should call the city foresters to receive a free permit to conduct the landscape work. “Foresters will then meet with the person receiving the permit and give instructions on how to properly trim their trees, Johnson said. After reading the Charlotte church story, I was tempted to call Courthouse Plaza to find out if the Arlington County Board had picked-up and moved south to Charlotte, NC. Time To Get Out Of That Bubble? “Reading and reflecting got him to some basics. Real diversity is intellectual. Whatever its flaws, America is the greatest country in the history of the world. The free market always solves problems better than government. It's the job of the state to be just, not to render social justice. And, most sobering, Mr. Mamet writes in "The Secret Knowledge," there are no perfect solutions to inequality, only trade-offs. “It's a wonder he didn't explicitly adopt this tragic view of reality earlier on. The play "Glengarry Glen Ross," for example, for which Mr. Mamet won the 1984 Pulitzer Prize, is about a group of desperate men competing with each other in a Chicago real estate office. At stake: a Cadillac for the top seller. Second place: a set of steak knives. Third prize: you're fired. “Needless to say, no one ends up getting the Caddie. "That's the essence of drama," Mr. Mamet says. "Anyone can write: And then we realized that Lithuanians are people too and we're all happier now. Who cares?" Tragedy is devastating, he says, precisely because it's about "people trying to do the best they can and ending up destroying each other. Thank goodness David Mamet’s bubble was burst. “The amount was beyond the expectations of Rep. Nancy McLain, R-Bullhead City, one of many sponsors of the legislation, which passed with heavy bipartisan support last year. I'm a little surprised it raised $13,000," she said. "I thought people would laugh at it, say, 'Ha ha,' and move on. The Tax Foundation also points out that “the federal government also has a debt reduction fund to which taxpayers can voluntarily contribute. It has already brought in $1.7 million in fiscal year 2011, and brought in $2.8 million last year. If you would like to contribute to reducing the nation's $14.3 trillion debt, you can do so here. Or, as TreasuryDirect.gov instructs." Arlingtonians, and indeed all Virginians, who think they are undertaxed, can make donations to Virginia’s Tax Me More Fund since the 2002 General Assembly passed the necessary legislation. The names of five Virginia families which have made donations to Virginia’s Tax Me More Fund appear at the Department of Taxation website. You will need to complete Form GFD, which you can obtain at the website. p.s. I am not sure the page has been updated since my recollection is that the names have been there for some time. Hey NSF Spokeswoman. Wake Up! The Washington Times is reporting today that the National Science Foundation has mismanaged $3 billion for things such as "testing shrimp's exercise ability on a treadmill" and for "Jell-O wrestling at the South Pole," based on an oversight report released by Sen. Tom Coburn (R-Oklahoma). In response, the Times reports, "An NSF spokeswoman said agency officials have a 'gold-standard spproach to peer review' for the projects they spend money on." The Washington Times' Stephen Dinan did go on to say that Sen. Tom Coburn's "report makes clear that the agency itself cracked down on some of the problems, including firing the organizer of the South Pole Jell-O wrestling event." "The report also identifies duplication between NSF and other departments and agencies. NSF is one of at least 15 federal departments, 72 sub-agencies, and 12 independent agencies engaged in federal research and development." How many other instances of $1.7 billion in "unspent funds sitting in expired" accounts are there? And the dunderheads on Capitol Hill can't stop the spending? How do they keep getting reelected? And for the NSF spokeswoman, she needs to look at who pays her salary? The last time I looked, it was America's taxpayers. Stop the Spending, Congress! Take Taxes "Off the Table"
In a letter to Senator Mitch McConnell last week (requires Adobe), leaders of a coalition of “limited government activists” asked Senators “to declare net tax increases ‘off the table’ in any budget or debt limit negotiations.” Among the coalition of activists were such groups as the National Taxpayers Union, Americans for Prosperity, 60 Plus Association, Small Business and Entrepreneurial Council, Hispanic Leadership Fund, and Tea Party Patriots. “The limited government movement is united around the unavoidable fact that Washington spends too much money, and that’s what has put our nation in debt. Higher taxes will simply fuel yet more spending, as it has in the past. Only when tax increases are no longer part of the conversation can the debate in Washington turn to where it squarely belongs—the Beltway’s addiction to spending. Senator Jim Webb (D) -- write to him or call (202) 224-4024. Senator Mark Warner (D) - write to him or call (202) 224-2023. Isn't the Federal Government Wonderful? Not! The U.S. General Accountability Office released two reports today regarding the so-called "stimulus bill" (officially the American Recovery and Reinvestment Act, but often referred to as Porkulus) that was signed into law on February 17, 2009. One was a report issued to the Senate’s Permanent Subcommittee on Investigations and two full committees. The second report was GAO testimony to the Permanent Subcommittee on Investigations. "Company primarily owes payroll taxes from the mid-2000s. The company generally did not make any federal tax deposits during that time. "Company received multiple Recovery Act awards. "At the same time that the company was not paying its federal tax deposit, a company executive had hundreds of thousands of dollars in casino transactions. "According to IRS records, a company executive admitted to paying other creditors while neglecting to pay payroll taxes. IRS assessed a TFRP against a key executive for failure to pay payroll taxes. "IRS established an installment agreement with the company to make monthly payments of over $1,000. "Federal government awarded the company millions of dollars in nonstimulus funds in the late 2000s. "IRS filed federal tax liens against this company." Time to call your representative on Capitol Hill? If you want to call, the switchboard number is (202) 224-3121. If you prefer writing to Senators Webb and Warner and Representative Moran, visit our May 14, 2011 Growls since we include links to their e-mail contact forms as well as their individual office phone numbers. UPDATE (5/25/11): Paul Caron at Tax Prof Blog links to a press release for the story, and then links to such media as Accounting Today, Politico, USA Today, and the Wall Street Journal where you can read more reporting. The Committee for a Responsible Federal Budget is a bipartisan, non-profit organization committed to educating the public about issues that have significant fiscal policy impact. The Committee includes many of the past chairs and directors of Congressional budget committees, the Congressional Budget Office, the Office of Management and Budget, the Government Accountability Office, and the Federal Reserve Board. Military: most common range was more than 50%; median response 30%; actual 19%. Medicare: most common range 11-20%; median response 20%; actual 13%. Government Pensions: most common range 1-5%; median 10%; actual 4%. Housing Assistance: most common range 1-5%; median 7%; actual 2%. Public Broadcasting: most common range 1-5%; median response 5%; actual 0.01%. Sounds like a good reason for ACTA membership and for visiting Growls as often as you can. “Author Delos Kinsman, writing while Roosevelt was president, said, “Individuals should contribute to the support of the government according to ability.” And “income is the most just measure of that ability.” Enlightened leaders like Teddy Roosevelt would redistribute wealth in the national interest. Is there any wonder why liberals aren’t keen about a flat tax, the FairTax, or returning to an “originalist” view of the U.S. Constitution? "Capitalism may be the sole avenue where otherwise debilitating character traits like greed and selfishness get channeled into harmonious community benefitting all. In capitalism, wealth is generated by mutually beneficial trade. Profit derives from adding value. The lure of gain engineers progress as directed by the market. "Allowing the greedy their gains spurs production which grows the pie for all of us. Progressive taxation and cumbersome red tape may somewhat constrain greed, but these deny others the benefit of their efforts. Redistributions of wealth reward those susceptible to laziness and sloth, but consumption without production shrinks the pie." Robert Gordon posted a great report yesterday on the Heritage Foundation’s blog, “The Foundry,” that should raise most taxpayers’ blood pressure. Gordon notes the Environmental Protection Agency (EPA) has 109 of 2,141 federal grant programs, and over “the past decade, the EPA awarded or continues to have open more than 7,500 grants, totaling $3,847,160,250 to non-profit groups alone,” just over $500,000 per grant. In addition, these non-profits often collect attorney fees from the federal government. “In November 2009, a dozen protesters triggered a traffic jam in an intersection of Chicago’s financial sector by laying down in a circle in the middle of the road, locking their arms together inside pieces of pipe. They were protesting the city’s climate exchange, part of a scheme to regulate CO2 emissions through permits. Ironically, it was a case of a left-leaning plan being attacked by the far left. Nor number 2 through number 38. And be happy you don’t live in New York or New Jersey. “For some time now, the Tax Foundation has published median property tax statistics for counties in the United States. These statistics are based on data from the American Community Survey. Previously, data limitations meant that only mid- to high-population counties could be included in the rankings. Now, for the first time, we are pleased to present data that includes nearly all counties in the United States. We rank counties three different ways: by median property taxes paid on homes, by median property taxes as a percentage of median home values, and by median property taxes as a percentage of median household income. “The Census Bureau recently released American Community Survey data as a five-year average, from 2005 to 2009. The larger number of survey responses and correspondingly larger sample sizes included in this five-year period allows estimates to be calculated for every county (or county-level entity) in the United States. Previously, these data releases were limited to one-year or three-year averages, and the lower sample sizes for these releases meant that only mid- to high-population counties were included. Arlington County ranked #39 in “median property taxes paid on homes” for the years 2005-2009 ($4,341). By comparison, Hunterdon County, New York New Jersey (apologies, 5/20/11) ranked #1 ($8,216). Arlington’s median home value during the period was $565,100 while Hunterdon County’s was $452,100. Considering “taxes as a percent of home value” Arlington ranked #1523 while Hunterdon ranked #136. The third way the Tax Foundation ranked the counties on property tax burden was “taxes as a percent of income.” Arlington’s “median household income” was $125,630, which ranked Arlington #328. By comparison, Hunterdon’s median household income was $112,474, which ranked it #8. Sometimes it’s good not to be “world class?” And thanks, Tax Foundation, for all your hard work. First, yesterday's Arlington Sun Gazette includes a story about Arlington County's tax burden, which cites comments by ACTA's president, Tim Wise. To no one’s surprise, last night, the Arlington County Board “accepted,” the “Community Energy and Sustainability Task Force Report” that was developed after last year’s Board chairman, Jay Fisette, and his colleagues adopted the “green ribbon” CES task force charter and appointed CES members on January 1, 2010 (link is to Mr. Fisette’s New Year’s Day 2010 “organizational meeting speech). “The task force report, completed in March after more than a year of study, calls for efforts to reduce the “carbon footprint” of the county by more than two-thirds, from 13.4 metric tons of carbon-dioxide emissions per person to 3 tons or less by 2050. Now let me tell you about David Evans, a mathematician and engineer with a PhD from Stanford University in electrical engineering. More importantly, he consulted for the Australian Greenhouse Office (now the Department of Climate Change) for eight years, modelling Australia's carbon in plants, mulch, soils, forestry, etc. Sounds like he would have fit right in with the consultants of this project. The reason I mention David Evans, however, is because of the op-ed he wrote in Canada’s Financial Post on April 8, 2011. The op-ed was based upon comments made to the Anti-Carbon-Tax Rally in Perth, Australia, on March 23. “The whole idea that carbon dioxide is the main cause of the recent global warming is based on a guess that was proved false by empirical evidence during the 1990s. But the gravy train was too big, with too many jobs, industries, trading profits, political careers, and the possibility of world government and total control riding on the outcome. So rather than admit they were wrong, the governments, and their tame climate scientists, now outrageously maintain the fiction that carbon dioxide is a dangerous pollutant. Earlier, I noted, Evans admitted to being on the global warming gravy train. In closing, let me ask you why your energy plan report so closely tracks track the local government’s executive guide for developing energy efficiency and sustainability plans that was published by IBM? And have you been scammed by Big Environment? Arlington taxpayers would like to know. We expect to address more fully the efforts of the energy/sustainability effort in the coming days and months. If you are interested in learning more about the county's agenda in pushing energy/sustainability plan, contact ACTA's president, Tim Wise. p.s. Links for the sources for the testimony will be posted tomorrow. You can watch last night's Board meeting at this Board webpage. "In a republican form of government, the true theory is to make no distinctions as to persons in the rates of taxation. Recognizing no class for special favors, we ought not to create a class for special burden." HT Page 127, "As Certain As Death: Quotations About Taxes," 2010. Tax Analysts, Inc.
"The moment you abandon . . . the cardinal principle of exacting from all individuals the same proportion of their income or their property, you are at sea without rudder or compass, and there is no amount of injustice or folly you may not commit." HT Page 127, "As Certain As Death: Quotations About Taxes," 2010. TaxAnalysts, Inc.
Read Your Own Newspaper, E.J. Sure hope E.J. reads the front-page story in today’s Post. Editors gave it “above-the-fold” attention, but the headline of the investigative story tells you most of what you want to know -- “Tasked with building homes for the poor, HUD has lost hundreds of millions on delayed or defunct construction deals nationwide.” (emphasis added). “At the heart of the problem lies HUD’s failure to track the pace of construction. “HUD monitors only when local agencies draw money from their federal accounts, not what is actually being built. That leaves HUD with little way of knowing when projects stall or die. Local housing agencies are supposed to notify the federal government, but they often fail to say anything. “If [housing agencies] fail to terminate projects as they should, we may not be aware of them right away,” Marquez said. “She said that it is not feasible for HUD to monitor thousands of ongoing developments and that local agencies should have their own project-tracking systems. “The Post independently analyzed HUD data to find about 700 troubled projects that were awarded $400 million. “But the actual number of stalled or terminated projects is likely to be much higher. The Post identified an additional 2,800 projects worth $1 billion that are in “final draw,” meaning the projects drew all of their allotted HUD funding but are still listed as open and ongoing in HUD’s records. “In some cases, the work was completed, but local agencies had failed to tell HUD. In other cases, however, projects were delayed or scrapped. The Post found abandoned projects in final draw from Texas to Florida to the D.C. region. “One dead project listed in final draw was proposed for downtown Rockville, where the nonprofit Montgomery Housing Partnership received $550,000 in 2008 to build a 109-unit apartment building. A poll released on Friday by the Gallup organization, based on a May 5-8 Gallup poll, shows that Americans oppose raising the debt ceiling by 47% to 19% with 34% saying they "don't know enough to say." Only 8% of Republicans approve raising the debt ceiling while 70% oppose with 33% of Democrats favor raising the ceiling and 26% opposing raising the ceiling. Independents oppose raising the ceiling 46% to 15%. Interestingly, 21% of Republicans told Gallup they "don't know enough to say," but 40% of both Independents and Democrats say they "don't know enough to say." Unfortunately, only 57% of Americans "say they are closely following the news about 'discussions to raise the U.S. debt ceiling, the maximum amount of money the U.S. government can borrow by law.'" "Regardless, it may be worthwhile to think back to what happened with the financial bailout legislation -- the so-called TARP -- in 2008. This was another unpopular piece of financial legislation that the president, the Treasury secretary, and the Fed chairman all supported, saying it was essential for global stability. After first voting this legislation down and watching the markets plunge, the Congress passed TARP. Efforts to pass unpopular legislation to raise the debt ceiling could create similar challenges." We growled on April 15 after the Arlington County Board adopted the Fiscal Year 2012 budget. So how did some other local jurisdictions resolve their budgets. The Virginia Municipal League has been reporting on the resolution of local jursdictions' FY 2012 budgets in their biweekly newsletter, Update. "Signs of economic recovery are faint in Hampton Roads. Real estate sales are improving, but foreclosures make up a significant portion of sales, keeping a lid on prices. Assessments continue to fall. In this environment, the spending and revenue choices facing local elected officials are challenging. "In Norfolk the city manager’s proposed budget will hold the line on real estate taxes. That runs counter to the trend in South Hampton Roads where city managers in Virginia Beach, Portsmouth, and Suffolk have all called for real estate tax increases. "Although the FY12 proposal does not include a general tax increase, Norfolk’s city manager is calling for a 10-cent-per-pack increase in the cigarette tax to 75 cents per pack and a doubling of the transient occupancy tax, adding $1 per night. Water and sewer rates also will increase. "The budget also includes the elimination of 69 positions with 18 layoffs. The number of layoffs could have been much higher, but some 150 employees accepted a $10,000 bonus to retire before July 1. For the third year in a row, city employees will receive no pay raises. "To close a $32 million budget gap, the proposal anticipates using $17 million in one-time revenues, as well as spending reductions imposed on dozens of agencies and non-profit organizations. School funding was not cut, but the school board’s request for additional funding was declined. "One issue capturing attention in Norfolk’s budget debate is the city’s level of indebtedness. Norfolk doubled its debt in a period of five years to a projected $1.056 billion. Although the city is within its self-imposed fiscal guidelines, including limiting debt payments to 10 percent of the general operating budget, debt payments this year and next are barely within that guideline. Norfolk owes about $4,348 for each of its citizens. This compares unfavorably to other South Hampton cities – $2,274 per capita for Virginia Beach, $3,162 per capita for Portsmouth, and $2,733 per capita for Suffolk. "Virginia Beach City Council has begun making decisions on the proposed FY12 budget. Although council rejected the city manager’s recommendation to raise the real estate tax rate by 2 cents and the personal property tax rate by 20 cents, they agreed that additional revenue is needed. To that end, homeowners will start paying a $10 monthly trash fee and higher stormwater fees. (The average homeowner will see an annual cost jump in stormwater fees from $88 to $115 in FY12, $134 in FY13, and $152 in FY14.) City Council also decided to take $23.7 million from the school division, and agreed to form a committee to study the funding formula the city uses to share money with the school system. "On the spending side of the ledger, council approved the first raises since 2008 – all employees will get a 2.5 percent raise under the plan. The city’s debt limit will also rise to $2,800 per capita, a 17 percent increase. "In Suffolk, city council is expected to adopt a 6 cent real estate tax hike, a new trash collection fee, and a nearly $1 million cut in local support for public education. City officials assert that higher taxes and fees are needed to help close a $11.9 million budget gap, resulting from falling home values and state revenue cuts at a time when the city’s obligations continue to mount. "In Hampton, city officials are trying to brace for possible cuts in the federally funded Community Development Block Grants (CDBG) program. The city receives about $2.6 million each year, which improves housing for low- and moderate-income residents. A possible program reduction of 16 percent is under discussion in Washington, D.C. A cut of that magnitude will hurt Hampton’s CDBG program as well as the 20 other Virginia cities participating in the federal program." In addition to the Hampton Roads jurisdictions above, the May 13 newsletter includes budget information for Alexandria, Manassas, Falls Church and Arlington County in Northern Virginia and Danville and Martinsville in Southside. Comparing the jurisdictions can produce rather sobering results. Other local budgets can be found in earlier issues of Update. "In his farewell address in 1961, President Dwight D. Eisenhower warned the country against an emerging “military-industrial complex” in which the allocation of government grants and contracts from the federal government to the private sector would create an undue influence over national defense policy and the agenda of scientific research. Today, another dangerous industrial complex looms on the horizon. But rather than warning us about it, President Obama encourages its growth. It is the “Green-Industrial Complex,” or what climate warrior Bjorn Lomborg has called the “Climate-Industrial Complex.” A web of players that includes corporations and environmental non-profits, business executives, lobbyists, and government officials, is promoting a renewable energy agenda and targeting coal producers and the oil industry as public enemy number one. We should ask, “Who benefits and who loses?” as green groups, companies and the government work together to create new energy and environmental policies. The Green-Industrial Complex is likely to reap huge profits, but consumers, workers and taxpayers will pay the price in the end." Read Ms. Carey's entire essay (requires Adobe). Then take some time to study Arlington County's Community Energy and Sustainability Task Force Report. Don't believe there's a connection? Read Ms. Carey's essay, and then take a hard look at how the community energy and sustainability task report came to be. “An IBD analysis of spending and tax data going back to the Truman administration shows that it's out-of-control spending, not taxes, that is driving the country's current fiscal mess. “As the chart nearby shows (i.e., the chart below), revenues as a percentage of GDP have remained remarkably constant at around 18% since the mid-1940s, regardless of whether a Democrat or a Republican was in the White House, and despite numerous tax hikes, tax cuts and endless tax-law changes that saw the top income tax bracket go from a high of 94% in 1945 to a low of 28% in 1988, and up and down ever since. “Even President Obama's 2012 budget plan, which would raise taxes on families making more than $250,000, wouldn't alter this trend. According to the CBO, the president's budget would produce tax revenues averaging 18.7% of GDP over the next 10 years. “What has changed dramatically over these years is federal spending. As the chart shows, average spending fluctuated as a share of the economy since Truman. But Obama's 2012 budget calls for federal spending to average 23.5% of GDP over the next decade — higher than at any time since World War II. Spending would top 24% of GDP by 2021. If that chart doesn't show the problem is spending, as opposed to some imaginary need to raise taxes, nothing does. Thanks John Merline and IBD! “Their study focuses on 16-to-24-year-old male high school dropouts, understandably a relatively inexperienced group of labor market participants. “Since minimum wage laws discriminate against the employment of the least-skilled worker, it shouldn't be surprising to find 16-to-24-year-old male high school dropouts its primary victims. “Among the white males, the authors find that "each 10% increase in a state or federal minimum wage has decreased employment by 2.5%; for Hispanic males, the figure is 1.2%. "But among black males in this group, each 10% increase in the minimum wage decreased employment by 6.5%." “The authors go on to say, "The effect is similar for hours worked: each 10% increase reduces hours worked by 3% among white males, 1.7% for Hispanic males, and 6.6% for black males." By the way, the Employment Policies Institute has an extensive collection of minimum wage studies. They focus on public policy involving employment growth, and also study so-called living wages and health care. Speaking of the Speed of Federal Spending . . . .
Who Exactly Is Propping-Up Whom? FY 2006: Local, 50.2%; State, 42.8%; Federal, 7.1%. FY 2010: Local, 49.2%; State, 39.9%; Federal, 10.9%. Arlington: Local, 83.6%; State, 12.1%; Federal, 4.3%. Fairfax County/City: Local, 74.5%; State, 19.0%; Federal, 6.6%. Loudoun: Local, 75.3%, State, 20.1%; Federal, 4.5%. Prince William: Local, 45.6%; State, 44.3%, Federal, 10.1%. Alexandria: Local, 79.4%; State, 13.6%; Federal, 7.1%. Before comparing numbers, let’s consider a couple of more numbers from Table 15 for the Northern Virginia school districts, i.e., cost per student spending and local revenues per student. Arlington: cost per student, $19,640; local revenues per student, $16,411. 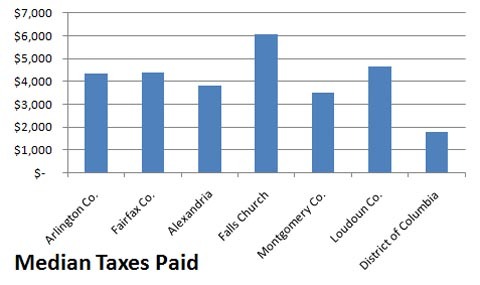 Fairfax County/City: cost per student, $12,912; local revenues per student, $9,614. Loudoun: cost per student, $12,688; local revenue per student, $9,557. Prince William: cost per student, $10,298; local revenue per student, $4,698. Alexandria: cost per student, $18,082; local revenue per student, $14,350. Wouldn’t it be great if Virginia afforded parents greater School Choice? That kind of competition would almost surely reduce the burden of paying for K-12 from the backs of Arlington County taxpayers. “If I had one thing to do over again, I would not have talked so much about green," he told a Massachusetts Institute of Technology audience. "Even though I believe in global warming and I believe in the science ... it just took on a connotation that was too elitist. "It was too precious, and it let opponents think that if you had a green initiative, you didn't care about jobs. I'm a businessman. That's all I care about, is jobs ... I'm kind of over the stage of arguing for a comprehensive energy policy. I'm back to keeping my head down and working." "General Electric CEO Jeff Immelt has finally renounced advocacy of global warming legislation . . . and we helped!" With the Arlington County Board getting ready to “accept” the Community Energy and Sustainability Task Force Report, Arlington taxpayers may want to ask Board members if it’s time to quit their green energy crusade and start running the county instead -- the same as GE CEO Jeff Immelt is getting back to by "keeping his head down and working." "I am more afraid of an army of one hundred sheep led by a lion than an army of one hundred lions led by a sheep." There are 24 charts in total, including federal spending (7); federal revenue (5); debt and deficits (6) and entitlements (6). The chart below shows how federal spending is growing faster than median income. “(T)ax increases are a bad idea – unless you favor bigger government." The video takes only seven minutes of your time. Inform yourself so you can inform the political elite as well as your neighbors. The video is also available at You Tube. "Roughly five million households receive rental assistance from programs managed by the Department of Housing and Urban Development (HUD). To be eligible for the government's rental vouchers, a family's income must be below either 50 percent or 80 percent of the area's median income, depending upon the program. Sponsored by Congresswoman Maxine Waters (CA-35), H.R. 1209 would change and streamline formulas for determining housing allowances, specifically for senior citizens, the disabled, and those with children and dependents. The bill would provide an additional 150,000 tenant-based vouchers. The average cost of each new voucher would amount to $7,500 and would be distributed on an annual basis. H.R. 1209 also creates 41,300 vouchers that would help to pay for HUD-related mortgages and to replace Section 8 dwellings. According to a report by the Congressional Budget Office (CBO), H.R. 1209 would result in $7.554 billion in new spending over the next five years. Up to 87 percent of the bill's cost would result from the new vouchers. NTUF also reported on the least expensive bill of the week, i.e., H.R. 1217, and H.R. 1297, introduced by Rep. Louie Gohmert of Texas, which was the "most friended" bill that would ensure the pay of military personnel in those cases when the government is shut down. "It is easy to think the State has a lot of different objects - military, political, economic, and what not. But in a way things are much simpler than that. The State exists simply to promote and to protect the ordinary happiness of human beings in this life. A husband and wife chatting over a fire, a couple of friends having a game of darts in a pub, a man reading a book in his own room or digging in his own garden - that is what the State is there for. And unless they are helping to increase and prolong and protect such moments, all the laws, parliaments, armies, courts, police, economics, etc., are simply a waste of time." Are Arlington’s Taxpayers That Much Happier? “Thirty-four percent (34%) voters believe student performance will improve if more money is spent on funding for schools and educations programs. A plurality (41%) disagrees and thinks that increased spending will not lead to improve student performance. Twenty-five percent (25%) aren’t sure. “The survey also found that voters tend to underestimate how much is spent on education. Thirty-nine percent (39%) say the average per student expenditure is less than $9,000 per year while only 12% think it’s higher than that. Nine percent (9%) estimate the right amount but a plurality of 40% is not sure. There is a wide range of expenditure on education depending upon the state and region. As noted above, the national average of the cost-per-student is about $9,000. On the other hand, the cost-per-student for Arlington County students in the Superintendent’s proposed FY 2012 budget was $18,115 per student. Sure makes you wonder how close to 100% the voters in the Rasmussen survey would gotten to the question about “getting their money’s worth from public schools” if told the cost per student was over $18,000 per student?